After The Academy Awards telecast, attendees typically attend the Governor's Ball, one of many post-Oscars parties that happen after the ceremony. But this year the Governor's Ball was also a crime scene, so to speak. 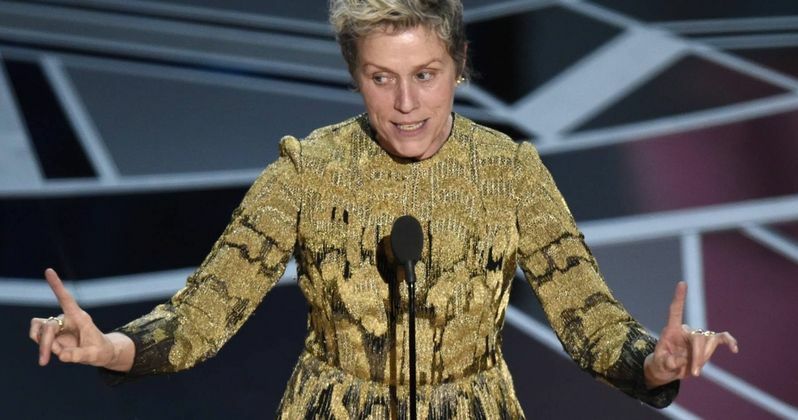 A man named Terry Bryant, 47, was arrested last night after he stole the Oscar belonging to Frances McDormand from her table. If that wasn't strange enough, the thief actually posted a Facebook Live video from the Governor's Ball at the Ray Dolby Ballroom, holding the Oscar and taking photos with other attendees, before he was apprehended. After the awards ceremony last night, Terry Bryant posted a Facebook Live video, which was just recently taken down but has still been captured and re-posted on YouTube and various other outlets. In the video, Bryant is seen sipping champagne when he pulls out an Oscar statue, stating that, "my team got this tonight, this is mine," before kissing the statue a number of times. He then asks those around him, "who wants to tell me congratulations," with several people around him congratulating him and taking pictures with the man and "his" Oscar. At one point, a woman tells him that she's going to the "Jimmy Kimmel party," which prompts him to ask an unseen person named Patrick where the party is at. He then proceeds to look into the camera and say, "What's up everybody? I got this. This is mine!" He then states he's, "about to go to so many parties," with another woman proclaiming that the award he's holding, "is your ticket into anything you want to go to." He then asks someone to give another unseen person, who is apparently with Terry, the information about the Jimmy Kimmel party because they're about to go to the Vanity Fair party. Towards the end of the video, Terry Bryant proclaims that he "won" this Academy Award, "for music," adding that, "I can't believe I got this." One woman said she got to hold one earlier and they're so heavy, and he asks if she wants to hold his trophy, which she does before being seen on camera stating that the trophy is "the real deal." While Terry is taking photos with others, a voice can be heard saying "Terry, we have to go. Terry, we have to go," shortly before the Facebook Live video ends. New York Times reporter Cara Buckley posted a photo of Buckley on Twitter, that was taken from Wolfgang Puck's photographer, who reportedly stopped him and got the Oscar back before he "disappeared" back into the ball. Frances McDormand told security to let him go, but the Los Angeles Police Department arrested him, and he was booked on felony grand theft charges at 11:50 PM last night, with his bail being set at $20,000. Authorities also confirmed that Terry Bryant did have a ticket to attend the Oscars and the Governor's Ball, and a quick glimpse at his social media pages including Facebook, Twitter and Instagram, reveal he's no stranger to awards shows and celebrities. On his Instagram page, he describes himself as an, "Alist Producer Entertainment journalist, A&E Editor Actor, TV host, U.N. Ambassador." His Instagram page also has photos from recent events like the Black Panther film premiere, the Grammy Awards, and he's also seen holding a SAG Award and at the Golden Globes, along with photos of Bryant alongside celebrities like Paris Hilton, Channing Tatum, his wife Jenna Dewan Tatum, Mariah Carey and more. Take a look at the video Terry Bryant posted on Facebook Live last night, along with the tweet from New York Times reporter Cara Buckley, and you can read more at Variety.